Many Alzheimer’s caregivers find it difficult to ask for much needed help, which leads to caregiver burnout. Caregivers often lose time for themselves . About 15 million Americans serve as an Alzheimer’s caregiver, an emotionally and physically exhausting job that can also be a strain on finances. Caregivers often lose time for themselves and may find they can’t participate in their favorite sports or hobbies as much, take spontaneous trips, be gone from home too long, spend weekends away, or take vacations. Added to this is the pain and sometimes loneliness of watching someone you love become lost to the disease of Alzheimer’s. Together, these hardships can increase the risk of anxiety, depression symptoms, financial hardship, and reduced quality of life in Alzheimer’s caregivers. This is often referred to as caregiver burnout. In fact, according to Bill Couturié, director of the HBO series Caregivers, sometimes the caregiver dies before the patient, due to the hardships. 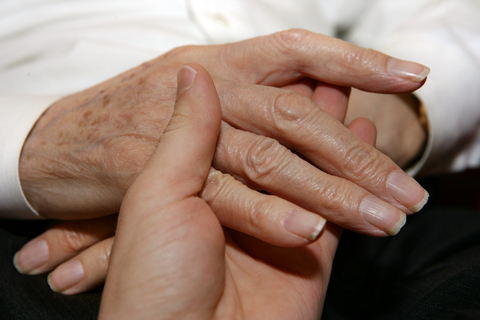 Many Alzheimer’s caregivers find it difficult to ask for much needed help. They may feel uncomfortable leaving their loved one with someone else. They may be afraid no one will help if they ask, or they don’t have the money themselves to hire needed help. Get comfortable asking friends, family, and others for help; you are not expected to do everything yourself. Be specific in your requests for help. Ask someone to make a meal, visit the person, take the person out for a short time, or stay with the person while you run an errand. Join a support group to share advice and information, and for the understanding you will receive from other caregivers. Visit the Alzheimer’s Association at http://www.alz.org/apps/findus.asp to find one in your area, or get support online at https://www.alzconnected.org/. Use a home health or adult day care service if you can. If you are not financially able to use these services, investigate local and national resources that can help you pay for help. One of the most important things an Alzheimer’s caregiver must do is to care for him or herself. Otherwise anxiety or depression symptoms can gain a foothold and spiral into a more severe or complicated health problem. In addition to seeking help and joining a support group, it’s important to schedule time with your friends, to spend on your favorite hobby or sport, to eat healthy foods, and to exercise regularly. Investing time in yourself to look after your own health will not only make Alzheimer’s care feel less overwhelming, but it will protect your brain health and reduce your own risk of developing Alzheimer’s. Chronic stress, itself, is linked to impaired cognition. For some natural stress management techniques, read Ashwagandha Benefits: Ease Stress and Anxiety by 44 Percent and Breathing Exercise for Natural Stress Relief. 2012 Alzheimer’s disease facts and figures. Alzheimer’s Association. Alzheimers Dement. 2012 Mar;8(2):131-68.
adult day care, aging, alzheimer, alzheimer s association, alzheimer s stages, alzheimers, anxiety, anxiety depression, anxiety or depression, ashwagandha benefits, brain, brain health, breathing exercise, chronic stress, dementia, dementia care, depression, depression symptoms, excessive tiredness, exercise, health, health problems, natural stress relief, pain, stress, stress and anxiety, stress management, stress management techniques, stress relief, tiredness. I had no idea that memory issues are not necessarily a normal part of aging – whoa! My parents and my in-laws are, shall we say, pre-elderly (I’m sure they would just love hearing this!) and are capable, independent people. However, because of my work and because I know plenty of people in my age group (old Gen X) who have dealt with a whole range of iseuss with elderly parents, I tend to do a lot of reading on this topic. I’ve just found your blog and see that it is chock-full of incredibly useful advice. Thanks for this post and for pointing out the resource on Caring.com! It’s unfortunate that many people are willing to accept cognitive decline as inevitable. It’s one of the reasons that we at NHA are so passionate about getting the word out that there is definitely a better alternative!